Signed and dated top c. verso, ... 2004/ Ben Quilty". David Hansen, Australian Impressionism , 'National Naturalism', pg. 281-287, Melbourne, 2007, 281. 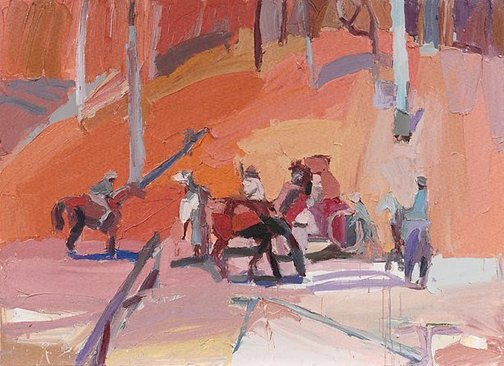 Terry Ingram, The Australian financial review , 'Australian icons on show: Odd lots', pg. 53, Sydney, 07 Oct 2004, 53. Review of exhibition held at Scott Livesey Art Dealer. Jeff Makin, Herald Sun , 'Art buyers hog the Quilty', pg. 97, Port Melbourne, 04 Oct 2004, 97 (illus.). Review of exhibition held at Scott Livesey Art Dealer. Robert Nelson., Age , 'Ben Quilty', Melbourne, 18 Oct 2004. Review of the exhibition 'Beauty rich and rare', held at Scott Livesey. Lisa Slade, Ben Quilty , 'Ben Quilty: we are history', pg. 14-30, Brisbane, 2009, 17 (colour illus. ), 22, 134.